55’ - Will Johnson dives on a ball into the area as he tries to get the call on the block off. Come on, man. 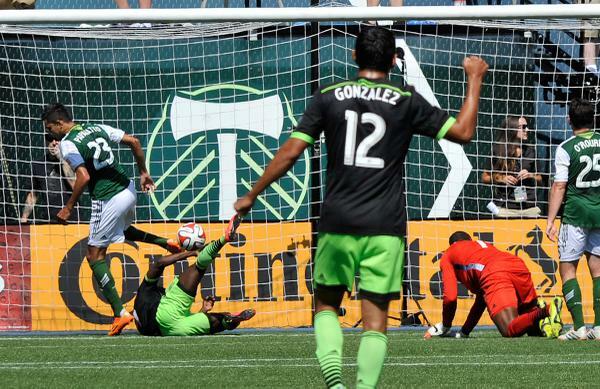 56’ - Yedlin with some nice defending on Nagbe who tries to get around him and throws D to the ground. TA goes nuts. Ok guys. 57’ - Sounders win a FK in a good spot at the top of the area. About 35 out. Gonzo to send in. 57’ - Andddd Gonzo is a nice guy and gives it right to Ricketts. 58’ - Leo with the #LeoBall along the line to Clint who gets a throw out of it. 58’ - Oba with a wee bit of space and BLASTS but it’s blocked out and going the other way comes Portland but Scott is fouled. Take it. 59’ - Urruti is having a day of it with Scott. Fouls going both ways. The Argentine is a wittle bit upset with the refs here. 60’ - Sounders getting forward again with Marco now switched over to the right. His cross in is claimed by Ricketts. Good spell though. 61’ - Then Ozzie sees yellow for a little argy bargy after the whistle. That happens. 61’ - A big #LeoBlock comes in and the Timbers win yet another corner. And then another. Nothing coming from them as yet. 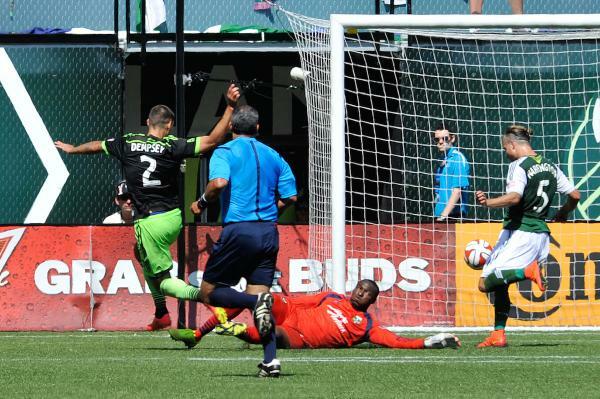 Here we have @clint_dempsey scoring to give the #Sounders the 2-0 lead at Portland. 63’ - All kinds of space for Urruti in the hole and he blasts one straight into the stands. 63’ - Change for the Sounders as Pappa comes off and is replaced by Chad Barrett. I like that move. 64’ - Urruti sees yellow because he wouldn’t keep his mouth shut. 65’ - Good stretch here from Seattle. Really running things and frustrating those little Timbers. 65’ - Wallace looks set to come in for the Portlands. 66’ - #AirMarshall times two. All the headers. 67’ - Fantastic no call there by Toledo as Nagbe gets into some space in the area and Yedlin shields him off the ball. 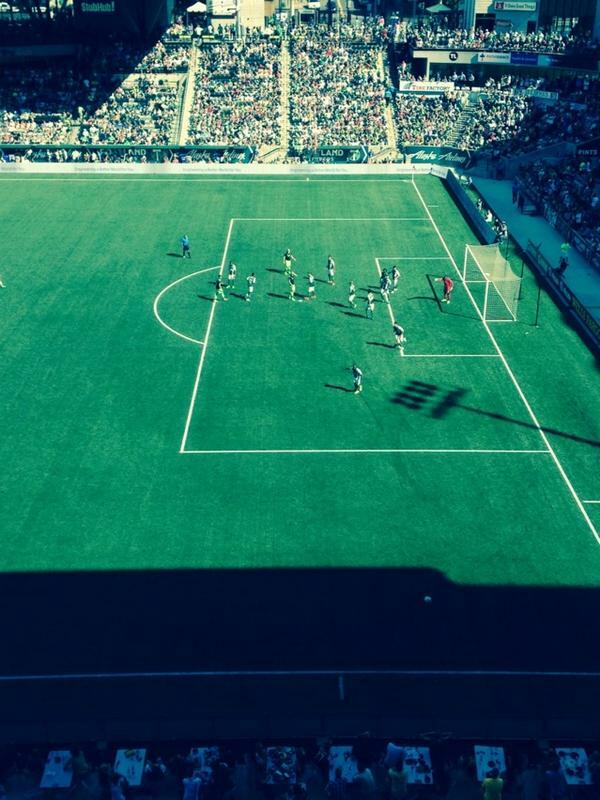 2-0 Seattle. 68’ - Ridgewell and Dempsey again getting into it. #LeoCross comes in and the pair battle. Foul on Clint. 69’ - Wallace tries to split Ozzie and DeAndre. Not today, sonny iimm. 70’ - GOALLLLLLLLL SOUNNNNNDDDDDDDERSSSSS!!!! IT’S CHAD BARRETT TO MAKE IT 3-0 SEATTLE!!!!!! 70’ - Ball lingers in the area as the #Sounders break and it pops out wide to Chad who fakes, cuts inside and shoots near post!!! 3-0.